Spirit (formerly BeeBee) – Adopted! Because he was strong enough to make it 33 days lost in the forests and swamps of Hampstead and Pender county…. Because he fought his way back to good health…. His new name is “Spirit” and it fits him perfectly. After searching for him so many days and nights, and although I had no intentions initially, I decided to adopt him. 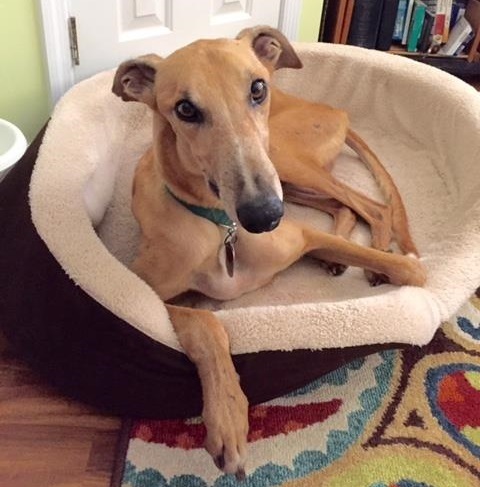 Spirit gets along great with his new greyhound sister, Athena, and little chihuahua sister, Lilly. His weight is up to 63.5 lbs now. Gone is the look of exhaustion, hunger and trauma. Spirit is embracing his new home, new family and new life. I will be forever grateful to all who helped search for him, donated toward his medical expenses, and sent prayers and words of encouragement for his recovery. Behold the power of one dog with a strong spirit and will to live, and the humans who answered the call. Keep your greyhounds on leash, with gates and doors secure. May you never have to go through this with your own greyhound. But if you do, reach out and we’ll be there. See BeeBee’s Facebook page for the latest on his recovery. We are so happy that BeeBee has been found! When he was rescued this past Thursday, he was taken directly to a vet. He had been on the run for 33 days and had traveled 17.5 miles. The story of how he was found can be seen on his Facebook page, and includes a map to show how far he’d gone. Today’s report says that he has been able to stand and is gradually getting stronger. He still has diarrhea. He is no longer on IV fluids. BeeBee will remain at the vet clinic over the weekend. He has quickly become a favorite of the clinic staff, letting them love on him as he gives weak kisses. We are hopeful that he will show significant improvement and be discharged Monday to his foster mom. However, he will require extensive veterinary care for retesting and treatment of his wounds over the next several weeks. 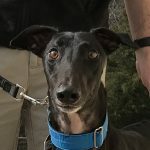 BeeBee’s adopters have officially signed his ownership back to Greyhound Friends of North Carolina. They had given him the name Bandit, but since he is responding to his previous kennel call name, BeeBee, that will be his name now. Or online at our donation page. By either method, please indicate that this donation is for BeeBee’s care. Greyhound Friends of North Carolina thanks all of you, those who provided encouragement during the search, those residents of Hampstead and Pender County who kept an eye out for him and spread word of his search on Facebook, and those of you now cheering BeeBee back to good health and a bright future.